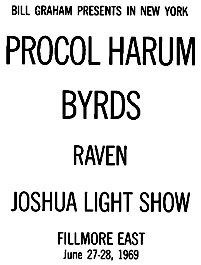 Procol Harum, the Britons who fuse rock and classics, played their loud, dramatic music at the Fillmore East this weekend. The group came to popularity in mid-1967 with the hit song A Whiter Shade of Pale. 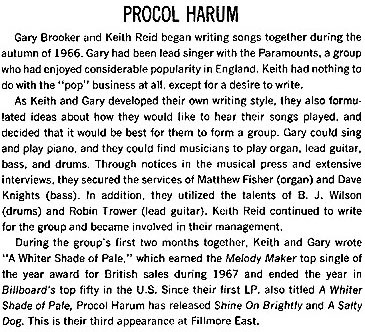 The melody was borrowed from Bach and much of Procol Harum's material is spiced with classical organ and piano figures. Its success in combining classical music and rock, and covering it with a vocal soul style and cryptic lyrics, made the group one of the most vital to emerge during the 'underground' boom of 1967. The approach is so good that the group can be forgiven for not changing significantly. It hasn't recorded any new material of real substance since then [sic! ], and in concert this weekend the best material was the old, like A Whiter Shade of Pale and Repent Walpurgis. 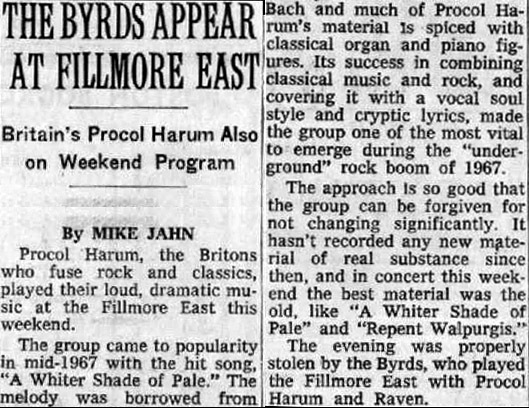 The evening was properly stolen by the Byrds, who played the Fillmore East with Procol Harum and Raven.